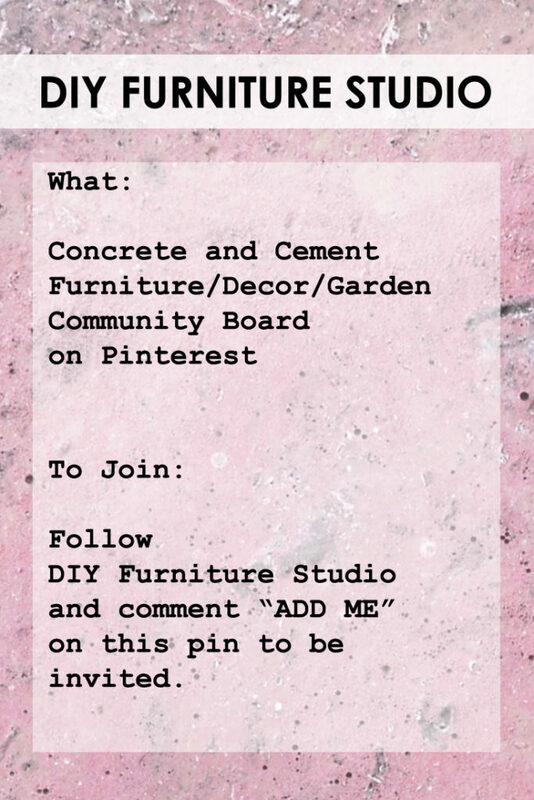 For all of you concrete/cement enthusiasts, please check out the DIY Furniture Studio Concrete and Cement Furniture/Decor/Garden Community Board on Pinterest. If you want to join as a contributor comment “ADD ME” on this pin: https://www.pinterest.com/pin/500603314815473738/ or email me at jen@diyfurniturestudio.com. The days are still short and cold here, but I’m starting to think about Spring and the flower garden. I don’t do all that much gardening right now, but I have in the past and very much appreciate garden/yard decorations in amongst the plants. 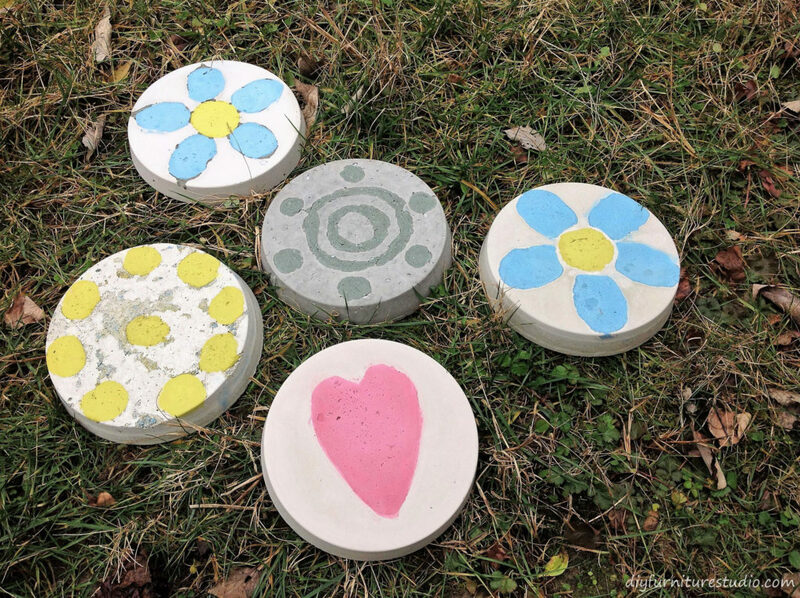 I wanted to do a rather easy garden art project with colored cement. So, I spent a bit of time figuring out a new way to make stepping stones that have cool colorful designs. Here is the short version. 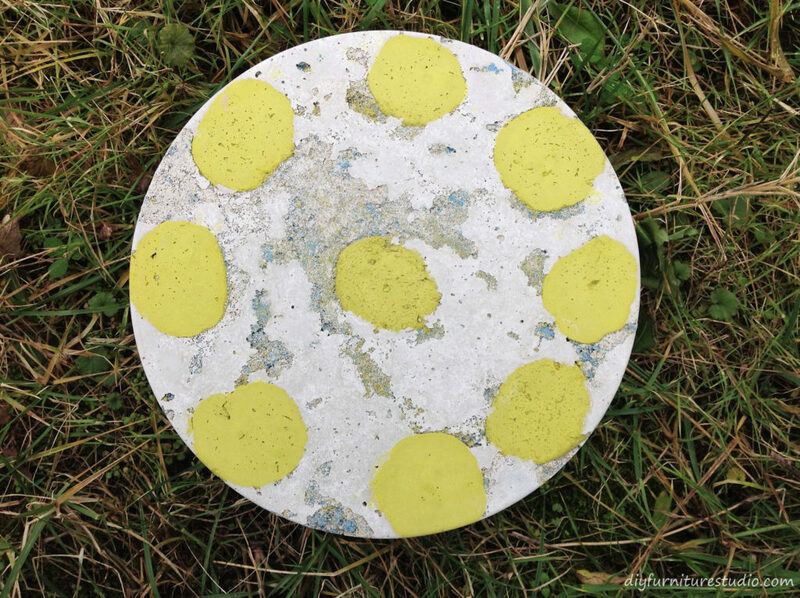 First, I made a colored cement shape by adding latex paint to the cement batch and shaping the cement as if it was clay. Then I plopped the colored shape in an oiled round cake pan, shaped it a bit more, and finally, I filled the rest of the mold with uncolored cement. 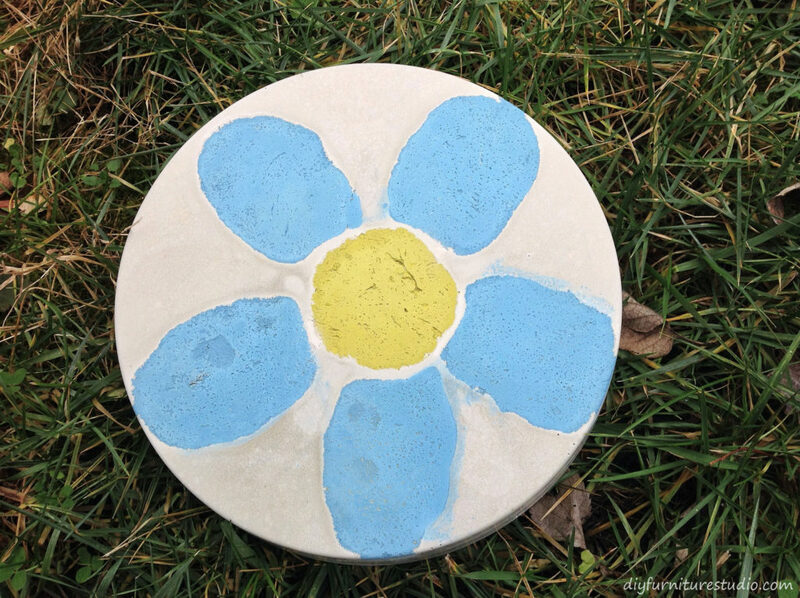 It’s an easy and fun way to get inlaid color into your cement projects. Every now and then I have a project that just doesn’t work out, at least not in time for the next time I want to post. This happened right before a recent Christmas-time trip to visit my sister and her family. In fact, two projects didn’t work well enough to put out there on the web. That left me in a bit of a bind, being away from home and not able to work on another project. Well the good news is, the break at Christmas gave me a chance to get a project gallery onto my blog, something I’ve wanted to do for a while. Check it out in the menu bar above. 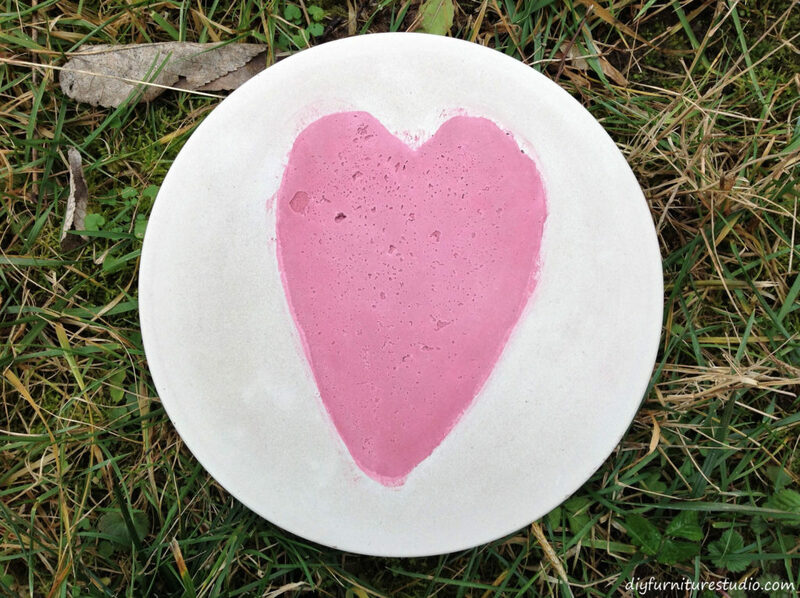 Another thing I had time for during the break is starting a new community Pinterest board–Concrete and Cement Furniture/Decor/Garden Community Board. I started it because I wanted a place for concrete/cement enthusiasts to have a place to gather and post. Check it out and follow the board if you like it. If you want to join as a contributor, type “ADD ME” on this pin https://www.pinterest.com/pin/500603314815473738/ (shown below). I’ll then send you an invite to the board, and after you accept the invite you can add pins to the board. You know who you are, and you need to join! During the Christmas trip, I spent considerable time with paper and a pencil on airplanes. I now have many furniture and decor ideas that need developing, and the procedures and details ferreted out–which for me usually takes some time and trial and error. Okay, to make a long story short, I still needed a project to put up on the blog in the short term, so I wandered around the house looking at what I had and came up with an idea. 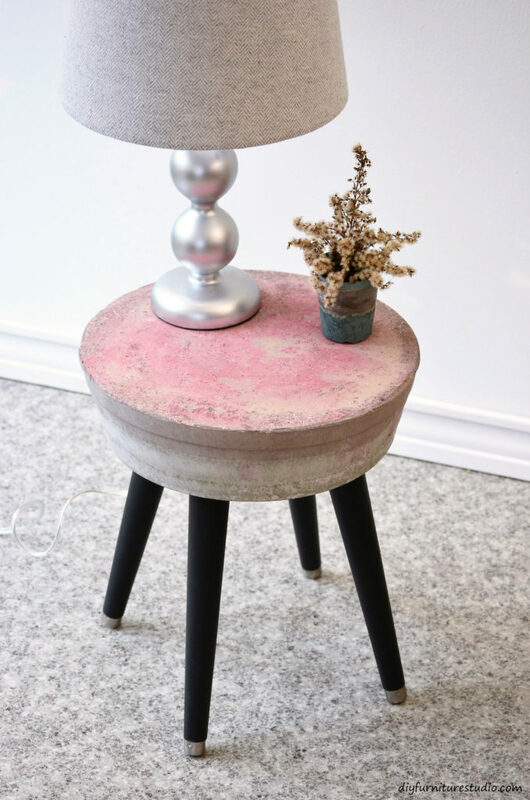 I call it a little cement low table with chunky legs, aka a cement plant stand with chunky legs. Happy New Year! The holidays are past, and I’m excited to get back to business making furniture and decor. 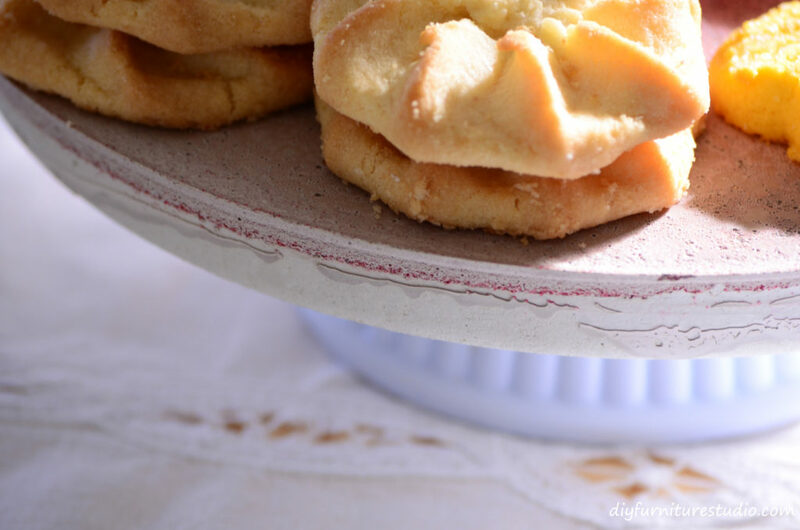 But first I want to introduce a few enhancements to the DIY Furniture Studio blog and a new Pinterest community board. The first new thing is the Project Gallery (link here), and located above in the menu bar for future reference. It’s a clickable gallery with a main photo for each project, as well as several process photos. The project gallery will let you see at a glance all the projects that await you! The next enhancement to the site is the CommentLuv app. For those of you who have blogs, this app lets you leave a link back to your most recent blog post. I think of it as just a little way to thank you for commenting. And we all love comments, don’t we! 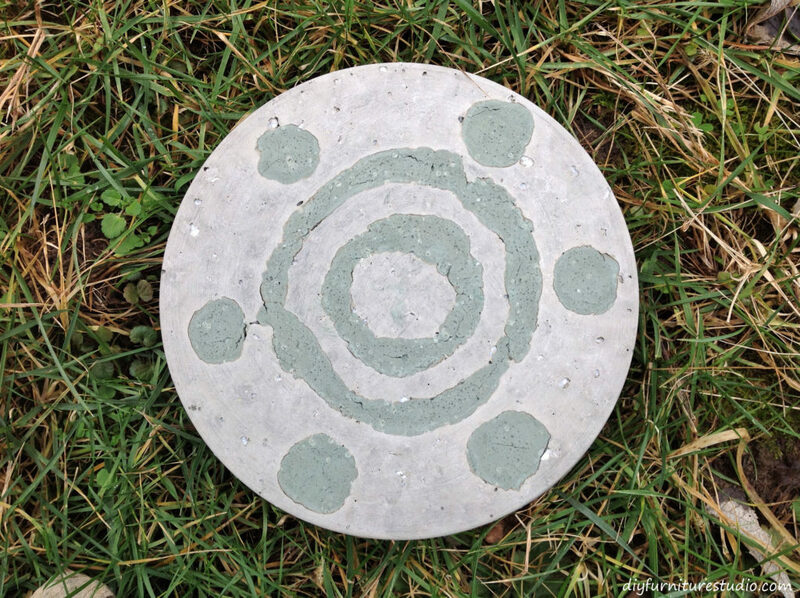 The last new thing for now is that I started a Cement/Concrete community board on Pinterest. I am enjoying many community boards for other topics, but hadn’t seen one for concrete/cement. 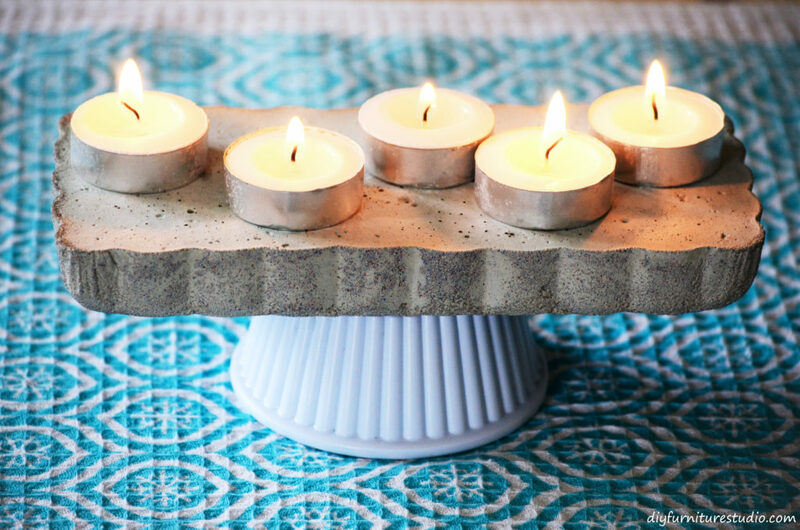 So please join me and others on the board and pin anything made of concrete, cement, papercrete, hypertufa that is furniture, decor, yard/garden art. 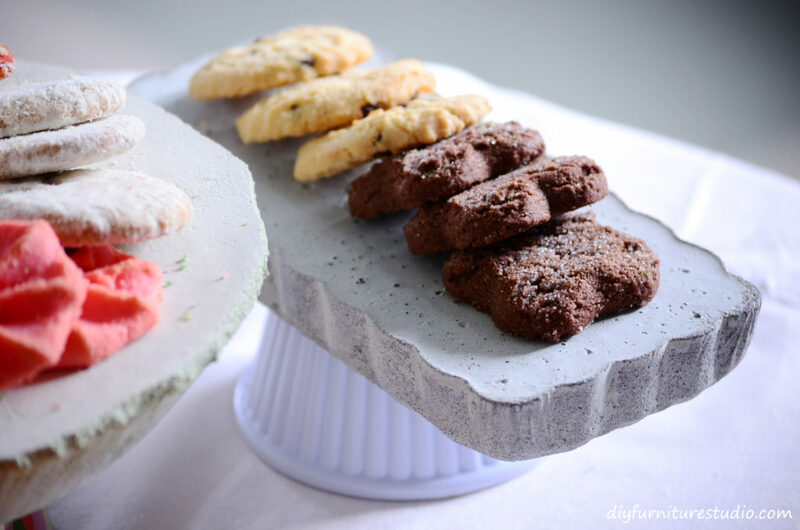 You can also pin anything related to making these objects, such as molds and mold-making materials. Pin up to 5 pins per day. This board is for tutorials, inspiration, ideas. Etsy posts and other things for sale are okay. To join, follow DIY Furniture Studio on Pinterest and comment “ADD ME” in the comments section of this pin https://www.pinterest.com/pin/500603314815473738/ (shown below). I will then send you an invite to join the board. One thing that drives how I design and build things is that I like to be able to change furniture and decor easily depending on style or purpose, if possible. I like to leave options open. 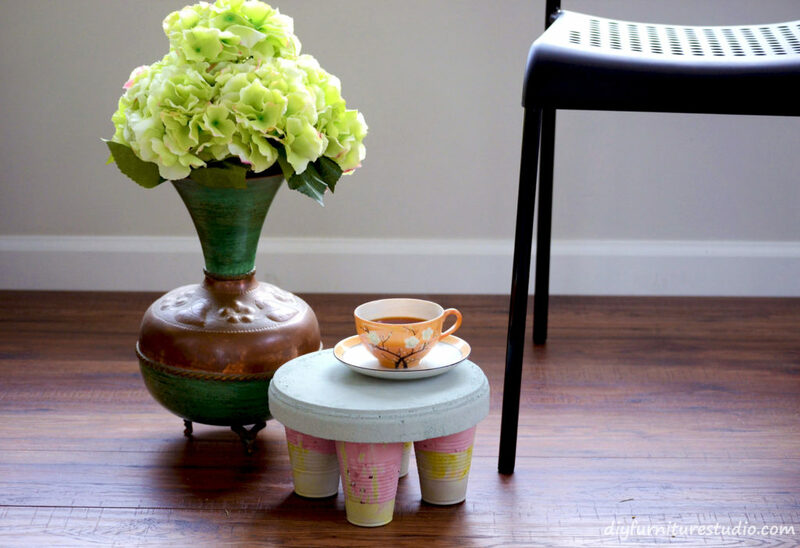 So what this looks like is a cement side table that has removable legs rather than legs imbedded in the cement. Or a pedestal bistro table that can easily be taken apart. 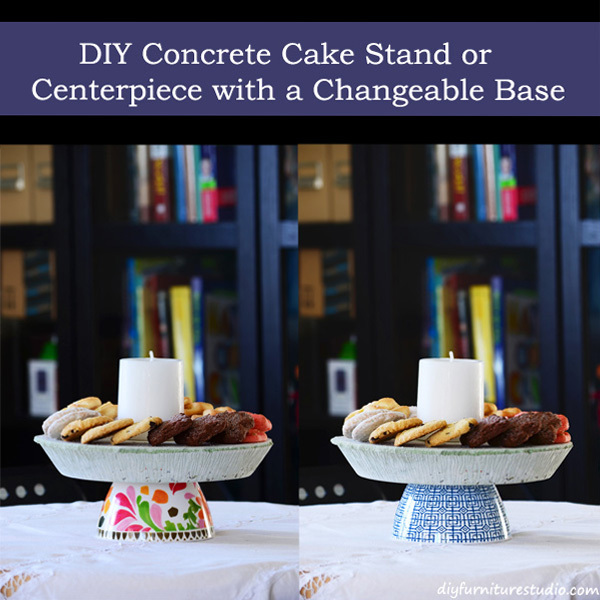 Along the same thought process, in this post I’ll show you how to make concrete (or cement) cake stands or centerpieces with bases that can be changed by simply removing one nut. I especially appreciate this because the look can be changed in a snap for different occasions, such as seasonally, for a baby shower, or for a tablescape having a certain color theme like for a wedding.